Two events held last week appeared only tangentially connected — at first glance, anyway. 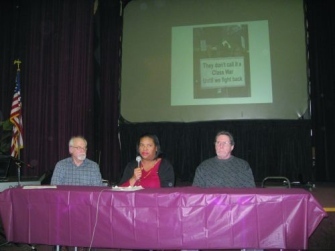 The first was a rally held by a coalition focused on helping homeowners fend off foreclosure and eviction. The other was a press conference on the fifth floor of the Coleman A. Young Municipal Center, outside the offices of the city of Detroit’s Law Department. 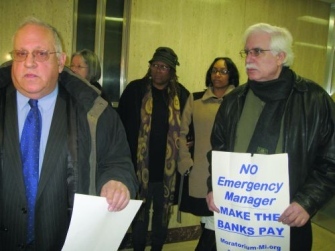 The request was initially filed in early January by David Sole, a retired city of Detroit employee, but it is really part of a larger group effort aimed at finding out exactly how banks and bonding agencies have been putting the screws to Detroit through a series of complicated and convoluted financial machinations. Please go to the Metro Times article and post online comments and submit letters to the editor.